A farmer who has been growing local variety brinjals for last 10 years and has been surviving on its yield, now feels, according to Carstoiu, that Bt Brinjal will make a difference for him and his family. Surprisingly Carstoiu without any evidence jumps to the conclusion that “ the Bt eggplant has shown close to 100 percent effectiveness in controlling pests. Not only have farmers’ incomes risen through increased yields, but the crop requires far fewer insecticide applications to reduce pests that threaten it”. There is no evidence shown in the links about how many farmers were given the seeds/seedlings, the yield of the crop, income earned etc. No report has yet been published by Bangladesh Agricultural Research Institute (BARI) on Bt Brinjal performances since 2014 except propaganda on showcase farmers. UBINIG investigations of the farmers from first to third round of seed distribution showed failure in the farmers’ fields and loss of income. According to UBINIG investigation, in the second round Bt brinjals seedlings were given to 108 farmers, of which 79 farmers were interviewed by UBINIG and were found to have massive failures. Farmers from the first round claimed compensation from BARI for their economic losses. In the third round of field cultivation, none of the farmers from second round were included. If it was successful then there would have been a demand from the farmers as well as from BARI and Department of Agricultural Extension (DAE) to continue with the same farmers who have gained some knowledge and experiences and establish the ‘successes. In January 2016, 37 farmers contacted by UBINIG told that they were not even contacted by DAE or BARI, and farmers were not interested to cultivate. The reasons were massive failures in the previous field cultivation. Three farmers in 3 districts have cultivated in smaller size plots at the request of the authorities. However, the entire management of cultivation was done by officials, not the farmers. In our search for Anisur Rahman Sheikh from Sadullahpur village (not mentioned in the story which district) UBINIG investigator Abdul Zabbar went to Bogra on 5th April, 2017 and found the Mohisaban market. No Brinjal seller could recognize the name Bt brinjal as one of the varieties sold in the market, as the Bt brinjals are brought to the market, grossly violating the approval condition, without any labels. 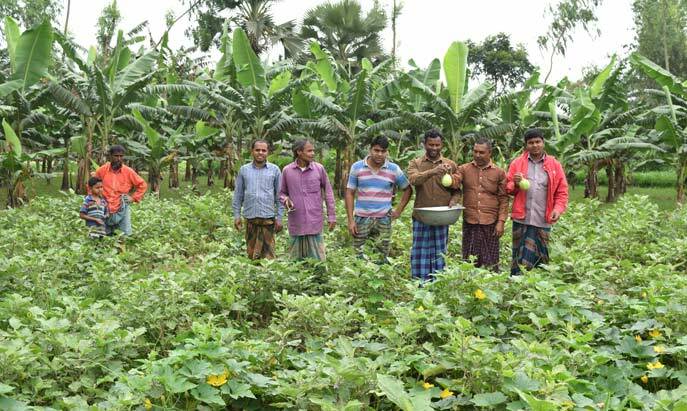 There is no village in the name of Shadullahpur in this district; but it could be in the adjacent district of Gaibandha according to Department of Agriculture Extension (DAE), Bogra and Bangladesh Academy of Rural Development (BARD), Bogra. The scientist Hasan Tanbir was not available but his contacts were given by the officials. When contacted over phone, Tanbir was not interested to discuss about his involvement and Crop Biotech’s claims. Farmer Mojibor Rahman's Btbrinjal field. Plenty of plants, but very few brinjals. The bowl is empty. In the visit UBINIG investigator Abdul Zabbar met Mujibur Rahman Montu, commonly known as Montu Mia (55) who was given by DAE officials 5 grams of Bt brinjal seeds in November 2016, which he planted in 10 decimal land. They told him that he will not have to use any pesticide in cultivating this brinjal. However the story is different. Montu Mia is a brinjal farmer, cultivating local varieties for many years. He had cultivated the local brinjals in 10 decimal piece of land last year. He tried Bt Brinjal at the request of DAE officials this year. But the plant did not flower in due time. He found that the leaves of Bt brinjal plants were curled due to infestation of insects and mite. The DAE officer advised him to buy pesticide from the local pesticide shop. Afterwards Montu Mia saw some flowers in the plants, but now the plants started to have shoot rottening. The DAE again suggested another pesticide for this disease. So he already applied two kinds of pesticides in the Bt Brinjal plants, yet he did not get enough yield of brinjals. Montu Mia lamented that in the same field of 10 decimal, he cultivated local variety brinjals before and earned Tk. 8,000 – Tk. 10,000, but from Bt brinjal he could earn Tk.700 to Tk.800 only - ten times lower income than local varieties . He could not get the return of the money he invested for the crop. He is advised to use more fertilizers and pesticides to get better yield. To rescue what remained he had to use more fertilizers and pesticides. 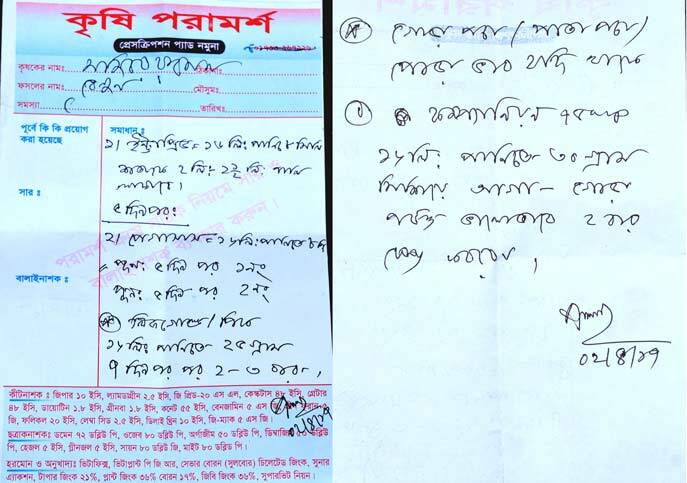 This prescription pad called “Krishi Poramorsho” ( Agricultural Advice). 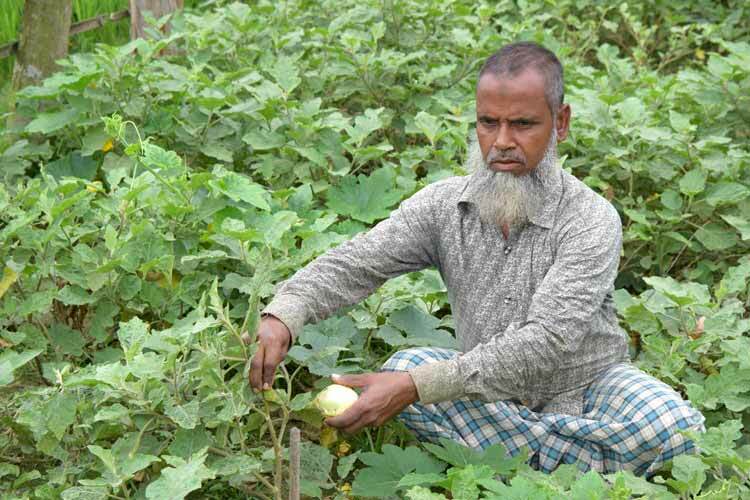 Deputy Agricultural Extension Officer Enamul Huq who gave 5 gm Bt Brinjal seeds to Mujibor Rahman and later prescribes four pesticides. The pesticides are (in brand names) Intrapev, Pegasus, Leafgold and Companion to be mixed with water and sprayed on the plants. The problem stated on the prescription is leaf and root rottening. This prescription was given on 2nd April, 2017. The name of the crop is written as ‘Begun’ or Brinjal, although the Mujibor went for the problem of Bt brinjal. Is it a way to hide the use of pesticides in Bt Brinjal? Bt Brinjal stories disseminated by its promoters have always been full of lies and total disregard to strict scientific and ethical principles. If ethical strictness were followed, a meaningful public discourse could have developed and public assessment of science and technology would have been objectively developed. Scientific experiment conducted in good intention, may fail for many reasons, but science could also gain from failures. Persistent false claims and blatant lies are not the only problems in the desperate attempt to introduce Bt Brinjal in Bangladesh, the sheer notion of science has been malignly compromised. Denial of all ethics of research in potentially risky areas such as transgenic crops will, in the end, further jeopardize the public assessment of a product and science will appear as a caricature of few propagandist who are desperate to safeguard the interest of transnational corporations. Bt brinjal is not only a failure, it is a disaster both to farmers and scientists.